The award for best kinesiology taping instruction manual of 2010 goes to RockTape’s PowerTaping: Taping Movements, Not Muscles, 2nd Edition. This 117 page manual, with over 70 color photos and illustrations, provides new insights into the field of kinesio taping for both rehabilitation and sports performance. It provides a comprehensive technical education for anyone utilizing kinesiology taping on a regular basis. A 3-step process beginning with preloading the structure through stretch, followed by taping for stabilization, then taping for decompression (pain relief). Taping instructions are provided for a wide variety of injuries and medical conditions. Enhancing lymphatic drainage to relieve swelling and edema. Step-by-step illustrated instructions are provided for the thigh, knee, ankle, neck and arm. Includes instructions for abdominal strain/thoraco-lumbar facet, rotational-lateral truck correction and upper cross syndrome. Taping techniques for a wide variety of pregnancy-related issues, including SI joint pain, carpal tunnel syndrome, rib pain, diaphragm pain, piriformis/posterior hip pain and more. RockTape’s groundbreaking research into taping entire “movement chains” to reduce fatigue and enhance muscle activation. Includes sport-specific taping instructions for running, swimming, throwing, cycling, kicking and squatting. This manual was written for health professionals and athletic trainers and contains some moderate to difficult medical terminology. The taping instructions, however, are simple and clearly illustrated and require no medical background to understand and follow. 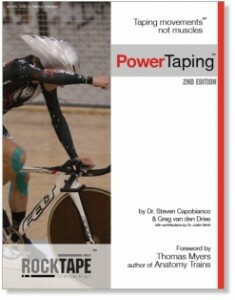 The PowerTaping Manual, 2nd Edition is now available at Theratape.com.